NEW CONSTRUCTION – in Rosewood nestled on .23 acre lot. This 3 Bedroom/2 1/2 bath home will have every bell and whistle your buyers are looking for! 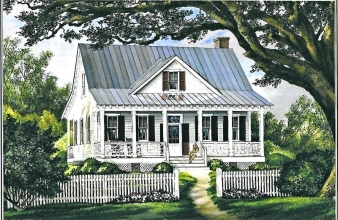 Southern charm with custom cottage features. Covered front porch on the front and rear of the home; Inside find open floor plan with Master on Main level with hardwood flooring; master suite opens onto rear covered porch; master bath with oversized tile shower with glass barn door enclosure; his and hers vanities with granite; comfort height toilets; walk-in closet with custom closet system; Great Room with gas fireplace; 9 ft ceilings down with large cove molding; Kitchen with white shaker style cabinets with soft close drawers; granite counter tops; pot filler; stainless Profile GE appliances to include refrigerator; stainless hood over gas range; subway tile backsplash; island; single oversized stainless sink; under counter lighting; recessed lights and garbage disposal with air switch; Low E windows; tankless hot water heater and more. So much to offer!